What can I expect in the long run with tilted knee caps? I have knee caps that track to the outside of my knee. I am a photographer --I carry 20LB of equipment for 8-10 hours at a time --but, only on certain days of the year when I am shooting weddings. My job also requires me to half squat a lot of the time and spend some time on the floor. However, I only have a shoot one or two days of the week and the rest of the time I spend at my computer or running around with my two year old son. I am also thirty pounds over weight with an athletic build. I have gone to my current Physical Therapist for eight weeks or so and built up my hips and glutes a lot. However, single leg squats are still painful without excessive warming up. I am also on my second Dr. in Austin. The first one wanted to operate right away based on the MRI and X-ray, but was okay with eight weeks of PT. However, the PT that I was doing was not helping --it was a misguided Physical Therapist. The second (current Dr) wanted to give me eight weeks, but wants to operate at the end of the year if I am not completely satisfied with my knee. I do not have a steady work out program, but have been very diligent with my PT at home and at the Dr. office. I am open for getting on a work out schedule --in my teens and twenties I was an athlete and this would be a good excuse to dedicate the time to do it again. My knee is still painful after shooting a wedding this weekend and the end of the year is coming soon. 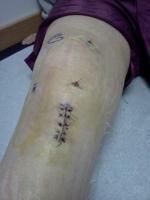 My question to you is what can I expect from my knee if I decide not to have the surgery? Will I always have some pain. Will I need to be committed to twenty minutes of PT every day for the next few years? If I get on a steady run/walk or bike program with moderate weight training what would you expect from my knees? I guess for most people, is this problem chronic, or does a steady work out program usually provide a healthy knee?